I've previously reviewed the RTL SDR V3 8bit USB Dongle (report available from the UDXF website files section) and wanted to test the SDRPlay RSP1, an 12bit SDR of very reasonable cost, to see how the performance differences would stack up betwixt the RTL V3 and the RSP1. In essence, exactly how much dynamic range and sensitivity is needed for acceptable yet spurious free HF reception via an adc? The 8bit V3 just couldn't take much of the harsh AMBC and HF RF environment in my location, even with preselection, high and low pass filtration, and gain adjustments, it still had spurs and aliased signals that made listening unsavory. Now don't get me wrong, the RTL V3 is a great little rig, you get far more than your monies worth with it in my opinion, but it still suffers from dynamic range issues in AMBC and HF use. To my mind, 8bits, even carefully tweaked, is just not enough for HF. -As much versatility in filter bandwidth, center, demodulation modes, and output options (audio L/R channel, I/Q) is desired. The above applies to analog as well as SDR radios. 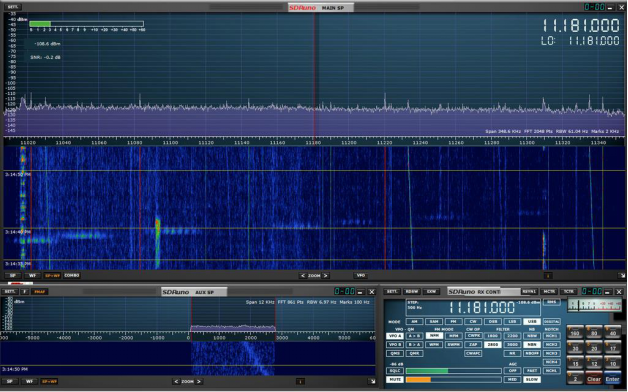 If you're into digital decoding, an SDR is the ultimate radio type for that pursuit. Out of all the above criterion, phase noise and dynamic range are about the hardest design obstacles to fulfill for a multiplicity of reasons. One good thing about a low phase noise oscillator is that a good one increases dynamic range and sensitivity in a given radio design by itself, all other particulars being the same. Once an oscillator is designed and manufactured, it's basically impossible to reduce phase noise, however slight tweaks may be made via software and/or PLL/DDS/VCO and hardware mods. That being said, you can get to the point in phase noise cleanliness that the receiver's phase noise is lower than the phase noise of the cleanest transmitted signal received, which while nice is futile. Now, someone who lived out in a rural area with low background noise at the frequency of interest can sacrifice dynamic range for sensitivity (say -140dB or better), and conversely someone who lives in a more urban environment will get along fine with much less sensitivity (say -110dB) and phase noise cleanliness because the urban environment is typically filled with noisemakers raising the local noise floor. RF noise pollution is so great in some city/urban areas one has to get some miles away from the outskirts to notice a lower noise floor. So, we know what level of radio performance we're looking for in our location. 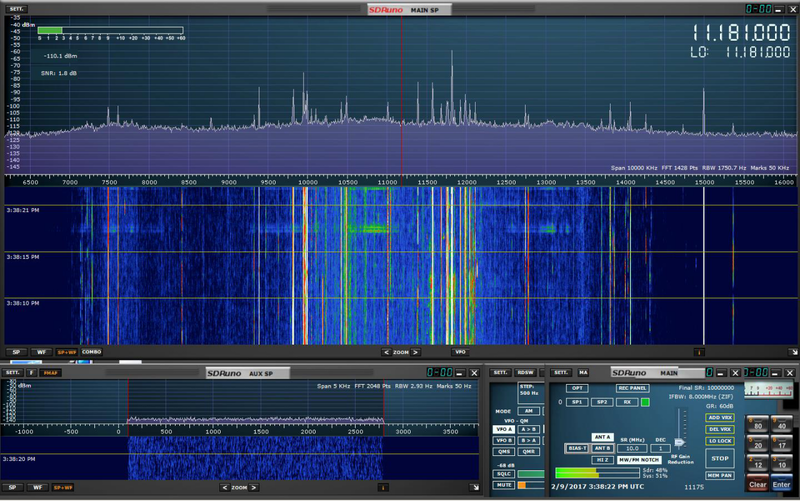 Above I hinted that SDR radios are naturally superb for digital mode decoding work, here I'll explain why they're desirable. By its essence of being based on code, algorithms, software, the versatility of SDR is orders of magnitude beyond that of an analog radio, for in short, code can do anything. Or so it seems. One lasting issue with analog radios is the fixed filter bandwidths, needing one to install typically expensive discrete filters to obtain differing selectivities, or to employ some method of variable or IF passband tuning which often degrades ultimate filter selectivity performance as well as dynamic range. Then there's the group delay figure, where signals in the middle of a given filter passband arrive sooner or later than the same signal at the ends of that filter. The delay is in milliseconds or picoseconds but it all makes parts of the signal late to the party, and while this may not keep a digital decoder from decoding that signal, it won't result in optimal decoder performance. This group delay hampers digital mode decoding as digital decoders want digital perfection from their inputs to their outputs, and analog filters cannot comply. In analog modes such as voice or music, the brain can tolerate a great deal of group delay as well as other distortions before intelligibility is lost. SDR does away with all that analog world distortion as the filters, their center frequency, and their overall characteristics, are determined not by fixed crystal or ceramic wafers nestled inside a discrete filter but by code, math. Math that can be altered on the fly in most cases. The filters in a SDR are typically designed to have little to no group delay, and this aids in digital decoding from strong signals to the weakest, as the decoder has the best chance to operate on a signal. They're also typically designed to have the steepest skirts as well as equal energies (no serious peaks or nulls aka ripple) from end to end. That being said, analog radios are better than nothing but today we can have better, and for far cheaper than ever before. I mean, ten years ago you would have had to have very deep pockets to have a radio that had almost infinite frequency range and filter bandwidths, memories, settings, etc. etc. not to mention the wonderful fish finder (spectrum display) that every SDR touts. Capabilities unimaginable in the consumer market only 25 years ago. And you can have it for less than $200 brand new today. As it turns out, the SDRPlay RSP1 specs met most of the above desirable features at a very attractive price point. Thusly, a request was made to SDRPlay for a sample of the RSP1 for comparison. 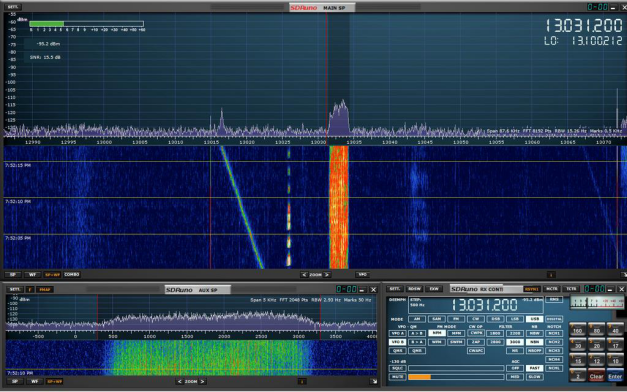 Not long ago, SDRPlay released the second iteration of their popular 12bit SDR, which improves upon the RSP1 with several requested enhancements. These enhancements are: TCXO, AMBC & FMBC notch/trap filters, conductive conformal coating inside the plastic case of the RSP2, and three antenna input ports, one of which is balanced feed. The forgoing features are exactly what I'd wished for any SDR for HF work to have, so this is very nice. Another feature some will find handy is input and output for the reference oscillator, if you've a stable and phase noise clean external ref oscillator to attach to the RSP2, or to slave two or more RSP2s to the same ref oscillator. The top version, the RSP2pro, also provides for a sturdy aluminum casing that adds physical protection over the plastic case of the RSP2. The fine folks at SDRPlay saw fit to send me one of their brand new RSP2 SDR's to review. The RSP2 is similar in size to the RSP1, with only some additional in/outputs making an external difference. In size, the RSP is about as big as a pack of cigarettes and about as heavy, it's a black box amongst black boxes. Please see the links section to ascertain what the RSP looks like. The RSP2 comes to you - if mailed from the UK as the evaluation unit was - in a well-padded envelope, inside which is nestled the RSP2 plus data sheet in a tidy plastic box. Nothing else is included unless specifically ordered from your retailer, you provide the USB cable and antenna adaptor as needed. In use at the bare essentials, the RSP2 requires only two connections, an antenna/feedline to provide signals to the device, and a USB cable to send processed signals to the host device. I had a quality USB cable festooned with RFI-reducing ferrites ready and waiting for the RSP2, and a SMA to UHF adaptor for the antenna side of the RSP2. The antenna coax feedline is also festooned with ferrites, these are needed due the proximity of the RFI-producing pc, LCD monitor, and attendant power supplies to the SDR and antenna itself, even though the antenna feed point is some 30+ feet away from the pc and SDR. You can operate the RSP2 wherever you can connect a USB cable/host device and antenna, but long USB cable runs will require repeaters and/or hubs, which to me means added latency and/or other issues that may mar SDR performance. In this instance my USB cable to the SDR is only a few feet in length, getting the SDR away from the back of the pc and attendant UPS (Uninterruptible Power Supply - these are also common RFI generators) where the PSU (and UPS) can be expected to emit its most notorious RFI. The RSP2 features two coaxial input of the SMA type and one input of the balanced type, a mating balanced connector is included with the RSP2, it uses screws to connect your balanced feedline to the connector. As I don't have a balanced feed antenna right now I didn't use the balanced feed input, but the balanced input is touted as being superior on HF and AMBC use, better for tuning down around 1KHz than the other coaxial inputs. I wanted the AMBC and FMBC filters available so I used the coaxial socket that supports the AMBC and FMBC notch filters. Also, a balanced feed line near PC components might allow some RFI into the SDR's input, and I try to avoid that by using a coaxial antenna feed. The balanced input would be dandy for those using, say, a table top loop for AMBC listening or VLF work. Ok so now you have an RSP2, what to do with it? Well, I like to listen to HF utility (both voice and digital), HAM, and SWBC signals as well as plumbing the AMBC band and lower, not so much the VHF and higher side of the radio spectrum, but I'm confident the RSP2 works very well in that environment too. 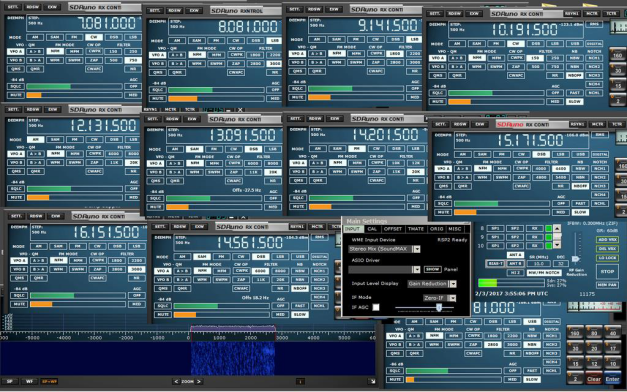 To this end of general radio listening, one needs at least one SDR control application, and as of right now my favorite for the RSP2 is SDRPlay's very own SDRuno software, which is free to dl and use. SDRuno is in many ways identical to the very worthy Studio1 SDR app in form and functionality. I previously preferred the HDSDR SDR app, it had very low cpu and memory use running the RTL V3 USB dongle and I expected the same from HDSDR with the RSP2, but such wasn't the case. With the HDSDR/RSP2 combo, the cpu usage was just as high as with SDRuno/RSP2 so no real benefit other than a lesser memory footprint and in fact some limitations, compared to SDRuno. For example, SDRuno provides for multiple VRX's; virtual receivers that can have different frequencies, modes, filter bandwidths, etc. as long as these frequencies are within the bandwidth of the primary VRX. I don't think you can use several instances of HDSDR on the same SDR rig, you've to supply a separate SDR rig per instance of HDSDR. 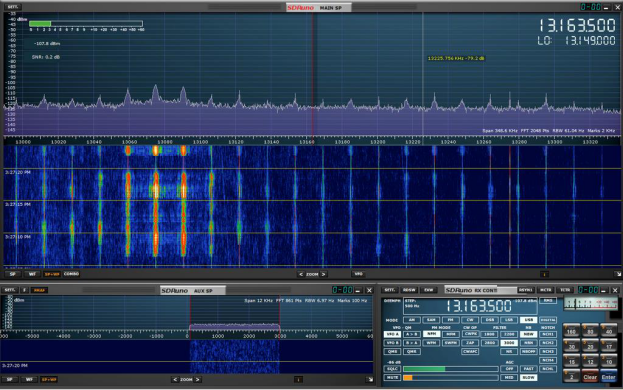 This isn't a knock on HDSDR, many other SDR apps are the same way. Say you wanted to cover a multitude of ALE frequencies, or perhaps a ssb voice network, or to check for parallel transmissions from a SWBC station, the SDRuno will do this with aplomb. To use multiple VRX's over the greatest frequency range, one will be looking at the Zero IF mode of operation which provides for the greatest spectrum in which to place the VRx's. Using Low IF mode, which I greatly prefer for HF use, reduces that available bandwidth where one can place the VRX's to either 8MHz or 2MHz. 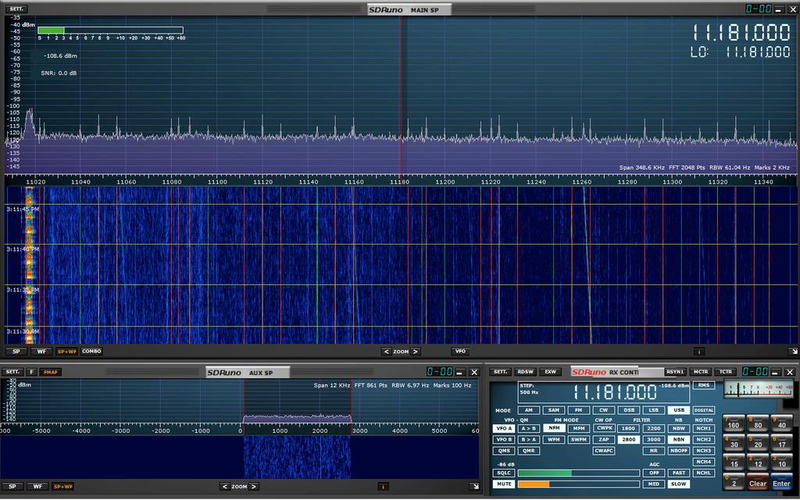 HDSDR offers no multiple VRX's at this time. The 10MHz wide Zero IF mode also provides for multiple decimation options (1 to 32), which can help improve host pc performance (by reducing cpu use) and reduce the viewed spectrum to something a bit more manageable. The Low IF mode allows either 8 or 2MHz spectrum, and only two decimation levels - 4 or 2, and happily these limitations provide a handy benefit, 8MHz Low IF greatly reduces cpu usage over 10MHz Zero IF mode, and 2MHz even more. Regarding Zero IF Vs Low IF mode: Due to aliases of strong signals at one end of the displayed spectrum possibly appearing at the opposite end of the Zero IF spectrum, Low IF mode is preferred by me, it has no aliases in the manner of the Zero IF mode, as well as less issue in the dc offset/center of the screen paradigm that many SDR rigs suffer. The VRX system is very worthwhile to monitoring duties, and something seldom seen in the"hobbyist"market, especially considering the price class of the RSP2 and the SDRuno software. As you can see from the included images, one can receive several frequencies concurrently with just the one receiver, maximizing efficiency and utility. One of the included images displays a string of HF frequencies of various modes, bandwidths spanning the 10MHz spectrum width to give a general idea of the feature. This RSP2/SDRuno/VRX paradigm is the working mans"Pluribus E Unum"of radio. I also consider the RSP2 to be the Ne Plus Ultra of cheap and cheerful radio, as long as we're throwing Latin around like we knew what we were talking about. For HF work I employ the AMBC/FM notch filter to reduce AMBC energy more or less just because I can. On HF, the activation of the AMBC notch filter doesn't raise or lower the HF noise floor or increase or decrease IMD or aliasing. It just makes me feel good that AMBC energy is attenuated and can't cause me any listening hardship. Consider it a best practice. For AMBC and VLF/LF work, the AMBC notch is off for AMBC listening even though the notch can be used as an attenuator for AMBC signals, I find that using the IF AGC and RF Gain Reduction controls better at eliminating IMD and aliasing than the AMBC notch. That being said, if you find the notch filter helps you deal with AMBC reception, by all means use it, I found that employing it in the AMBC band when strong signals were present the receiver overloaded - possibly due to the diodes used to switch the notch in and out of the signal path, hence favoring the IF Gain and RF Gain controls to vary the sensitivity. An attenuator in the antenna lead would come in handy for such situations to keep front end input diodes from being saturated with RF - which results in massive imd across the spectrum of the afflicted radio, and can even be received by other nearby receivers if severe enough. In all cases, I run the IF AGC setting set to manual (uncheck the auto box to manually set the IF Gain) and the IF AGC set to just below the"IF"characters in the Low IF menu item on the IF AGC control panel, and the RF Gain Reduction control set to one notch up from the lowermost setting. This ensures most sensitivity in the RF front end while still being very resistant to overload, and at least some gain in the IF strip. Some users may prefer to leave the IF AGC set to automatic but I dislike this feature in most every SDR I've used, the spectrum display screen is constantly jumping due to the AGC. In practical use, the RSP2 runs very well, even outstandingly, considering the price. This is in direct contrast to those few reviews I've read; accounts of users decrying poor performance from the RSP due to IMD, overload, etc. etc. I'm certain that if a bit of adjustment had been made to the IF AGC and RF Gain Reduction controls those users would have found, in most cases but the direst, the RSP2 perfectly suited to the radio environment of their location. If you have an AM or FM broadcast station within a few miles, you've a serious RF power issue that will have to be dealt with via filtering and attenuation external to just about any receiver you choose to use, RSP or no. Decoder apps have all worked flawlessly with the RSP2, as I expected. The decoders all use the Windows Stereo Mixer API to pipe audio from the SDR to the Decoder application(s) and no issues were seen. I had a number of decoders running on several occasions to test performance on the same as well as different modes (for those channels that carry more than one digital mode) and the low cpu usage of the RSP2 and SDRuno combination produced excellent results. Copied were ALE, S4285, HF Fax, CW, Mil 110A and B, and several other modes. I feel that the price to performance ratio of the RSP2 cannot be beaten for decoding work, period. That is, unless you got a higher performance SDR for free. In voice mode work, I found the RSP2 to send sterling audio to the PC, and I have to say the audio is as good as I've ever had for an HF receiver, and I've had a lot of HF receivers. 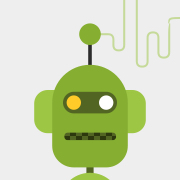 AMBC and SWBC stations, if the signal is clean and you open the filter bandwidth up a bit for better fidelity, activate the SAM and DSB controls, they sound like you're right in the studio instead of being perhaps halfway across the globe from the transmitter site. I've tried plain old am mode in the RSP2 and while fine on perfect signals, after using the SAM mode (Synchronous AM demodulator) and DSB (Double Side Band - where both sidebands are recovered, which reduces distortion on am signals in most cases) there's no going back to AM mode unless I have to. If the AM signal has interference on one sideband, you can select which sideband to demodulate and still use SAM mode, just deselect DSB and select which sideband is clearest. In SSB work, the audio is similarly clean and being able to adjust the low pass and high pass of the filtered signal is exactly what a SSB dxer wants. All that being said, the cleanliness of audio in a SDR can greatly depend upon the host device used to control the SDR, if that device has a clean audio chain you'll get the cleanest audio out of the RSP2, if the audio chain is only mediocre, well you get the idea. Add to the forgoing the fact that if the signal itself is dirty to begin with, don't expect the SDR to clean it up to perfection. This concludes the review of the SDRPlay RSP2, and I hope you've enjoyed or at least gotten some useful ideas out of my take on the RSP2. Please see the links section for more info on the RSP and SDRuno as well as digital mode decoding and general utility listening, they will provide much more detailed info.